Full-slab Porcelain is composed of clay and mineral colorings bonded by heat and pressure. When clay is fired, it becomes an incredibly durable stone: it can be broken, but it can never be destroyed. Porcelain is both durable and easy to maintain. Unlike quartz, porcelain can be installed indoors or outdoors and can be installed around fireplaces. 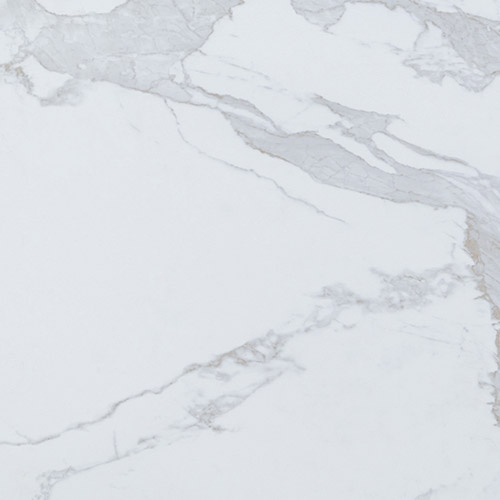 Because porcelain is manmade, like quartz, it gives you the widest freedom of color and style choice, and it allows you to use color tones that would be too soft or absorbent in a natural stone. However, most porcelain patterns are printed onto the surface rather than full bodied (pattern throughout the profile), which means that you will have to mitre the profile to achieve the full-bodied look, and you will need to frame off exposed edges in wall applications. Porcelain is particularly well-suited for wall applications such as grout-less showers, feature walls, fireplaces, and full-height backsplashes, allowing you to achieve the wow factor of exotic marbles or other absorbent materials without the concerns of maintenance, staining, and scratching. Many porcelain colors are available in both polished and matte finishes. Unlike natural stone which GX can resurface, matte finishes on porcelain can only be achieved during the manufacturing of the stone, so you cannot convert one to the other. Pyrolithic Stone is composed of natural minerals in a patented combination liquified by high heat, simulating the natural formation of rock through magma. The end result is one of the most durable surfaces on the market today. Unlike quartz, which is a combination of quartz and resins, pyrolithic stone is 100% mineral based and contains no resins. While pyrolithic stone has many similar endurance characteristics to porcelain, unlike most porcelain surfaces, pyrolithic stone is full-bodied, so it is not necessary to mitre or conceal edges. Pyrolithic stone imitates the patterns found in marbles, giving you the design look and tones of a marble, with an endurance and low maintenance that surpasses granite. Pyrolithic stone is only available in polished finishes and cannot be manually honed.